We got to the museum around 9am, half an hour before they started letting people into the build at large. If you do go, getting there early is much to your advantage. The line was several hundred people long when we got there, and talking to the docents, apparently today was pretty light. The crowds were incredible. Even getting there when they opened, we only got maybe two hours before we spent the rest of the day just tripping over other people. By lunch, they had reached capacity, and only let people in count for count, as far as I could tell (unconfirmed). The stairs from the parking are in the second picture. We were able to get a space on the B1 floor, and I didn't see how deep it went (at least one more layer), but it was not big. The rate was something like $3 an hour. 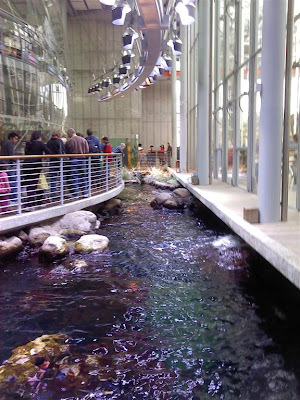 In the lobby, there were several pool displays, including a string ray tank, a tide pools, and this one on salt marshes. They made for something interesting to look at as you waited in line for other exhibits, like I was when I took this picture. 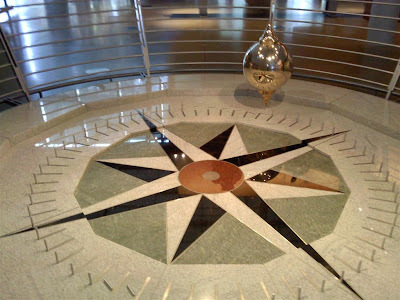 They had the classic Foucault pendulum display, which is a pendulum that swings independent of the Earth's rotation, so as the Earth rotates under it, the pendulum knocks down pegs standing below it. This, and the half hour video in the planetarium about the sun, were the only displays that wasn't entirely biology-based. 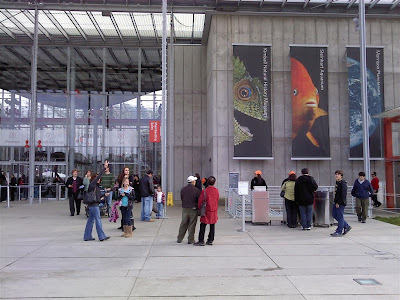 If you're a big fan of learning about nature, this should be an interesting museum for you. If you're something like, say, a physical sciences engineer, the general focus of the entire facility may become a little tedious after a few hours. 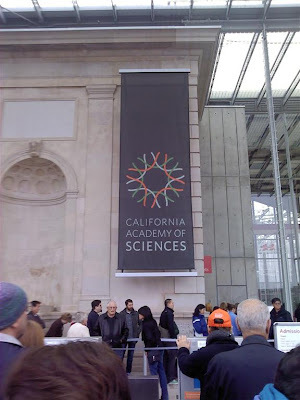 Of all of the exhibits, I would say the two definitely worth making sure you see are the living roof and the rain forest exhibit. The living roof is a variety of plants designed to decrease the cooling cost for the entire building. Just the utter scale of it is quite impressive. On the left of the picture, you can see one part of the solar system circling the entire building. Their informational sign about it didn't give any useful specs, but some back-of-the-envelope calculations put the system on the order of 100kW (point of reference, our household system is 3kW). On the right, you can see some of the automatic potholes. These are computer controlled as part of the buildings climate control, which is pretty cool. 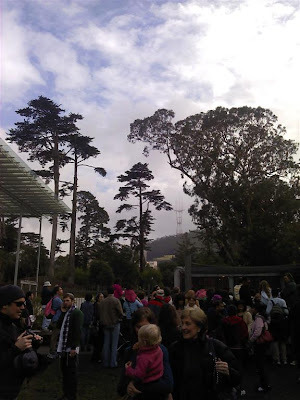 Being a mid-50Fs day in San Fransisco, it had the top two rows of pots open on one of the two mounds, which kept most of the building quite pleasant, with the disadvantage that the entry way had a very noticeable and chilly draft coming in. The last exhibit we did was the one on the rain forest. 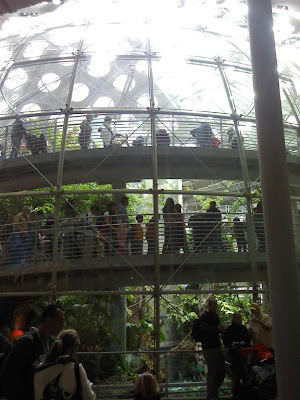 They built a bio containment dome, and built this very impressive recreation of a segment of the rain forest. Plan on spending ~45 minutes once you get into the exhibit, after a 30-60 minute line. You are let in at ground level through an air lock, and then progress up three levels of walkway around the perimeter of the dome. At the end of each layer is exhibits on a variety of plants and animals found in the rain forest, which couldn't be integrated into the exhibit at large. This included many snakes, frogs (poisonous), spiders (some with 3-4 inch leg spans), and more plants. Once you reach the top, you ride an elevator down to below the pool. where you can look up on the catfish swimming in the bottom of the exhibit. This was the most impressive exhibit in the museum, due to just the shear scale to it. Over all, it was a very well done museum. The facilities were well maintained, the docents were friendly and well placed, and the exhibits are well targeted at the lay person. Like I said already, the only reason I didn't enjoy it significantly more than I did was due to my personal lack of interest in biology.